A perfect Sunday afternoon is a premium anywhere! There are so many activities that call out to us. But here in Mississippi, the 24th most “bike-friendly” state in our great nation, cycling is at the top of our list! 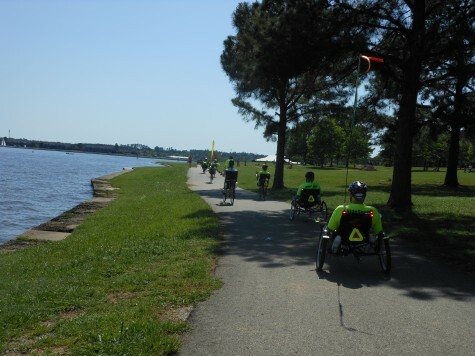 The Ridgeland bike trails were crowded with all types of cyclists of all ages. Families pushing their young kids, and adults, feeling like kids, were everywhere! Our long line of Reunion Riders seemed to grab everyone’s attention as we snaked through Old Trace Park just a few feet from the water where sailors, paddlers and motor boaters were enjoying the breezy, 74 degree, sunny afternoon. All types of trikes and bikes were represented, even a tandem! Bike trail near the Reservoir. Most of the group pedaled to the Old Craft Center on the trails, while some branched off to tour other parts of the trail network. A few riders had already been riding on the adjacent Natchez Trace . . . another premium cycling area. While some turned back for other activities, many of the large group of riders rode to the west end of the trail and back. The trail leads almost to Clinton and parallels the Natchez Trace. What a great trail to ride with your family! The real premium, however, is the fantastic group of loyal customers that have been around for almost all of our fifteen years of being in business! We have three tee-shirts, or jerseys, to give away to Jim Lee (2000), Bob McGuire (2003), and David Read (2003). If you were there Sunday and have been a customer longer than these guys, let us know. What a treasure to have folks that continue to care for and support your business all these years! And we have lots of you! Heck, Doug Morgan had just finished a one day, 250 mile ride in New Orleans early Sunday morning, but he and Laura made the effort to show up and cheer us on! Johnny and Beth helped us by being there and making lots of photos. We will load these on the web site soon. Thank you Johnny! A great group for the first RideSouth Reunion Ride! Thanks to everyone who made the first Reunion Ride, new and old customers! If you like the ride, couldn’t make it and have suggestions for another ride, please let us know. We are planning a ride to Vicksburg soon, so stay tuned for that date. A possible date is May 5, the day after the Ridgeland Century. Let us know if you are interested. If that date doesn’t work, we will choose another . . . since we hope to be around long after another fifteen years! And . . . with premium friends and supporters like you, we will! Previous post: Used Bicycle & Kayak Sale!